The Presidency of the Socialist Federal Republic of Yugoslavia (Serbian: Predsedništvo SFRJ, Председништво СФРЈ; Croatian: Predsjedništvo SFRJ; Slovene: Predsedstvo SFRJ; Macedonian: Председателство на СФРЈ), also known as the Presidium, was the collective head of state of the Socialist Federal Republic of Yugoslavia. It was established in 1971 according to amendments to the 1963 Constitution and reorganized by the 1974 Constitution. Up to 1974, the Presidency had 23 members – three from each republic, two from each autonomous province and President Josip Broz Tito. In 1974 the Presidency was reduced to 9 members – one from each republic and autonomous province and, until 1988, President of the League of Communists of Yugoslavia ex officio. The Presidency had eight members elected by parliaments of each republic and autonomous province and proclaimed by the Federal Assembly of the SFRY, the ninth member was president of the Presidium of the League of Communists of Yugoslavia. This ex officio membership of the LCY leader was abolished by the constitutional changes in autumn 1988. The mandate of the Presidency lasted five years so the nine-member Presidency was elected in total four times - in 1974, 1979, 1984 and 1989. 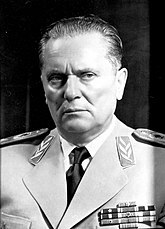 Until 1980 most of powers of the Presidency (and control over the country in general) were in fact exercised by Josip Broz Tito, who was president of the republic for life. After his death in May 1980, his office stayed vacant and the Presidency began to function according to the constitution. Sometimes, the Presidency held its sessions in an extended composition. Besides the members of the actual Presidency, in such sessions took part following officials: chairman of the Federal Assembly, chairman and vice-chairman of the Federal Executive Council (the government), federal secretaries (ministers) of defense, interior and foreign affairs, chairman of the Federal Conference of the Socialist Alliance of Working People of Yugoslavia and chairmen of the Presidencies of the Yugoslav republics and autonomous provinces. The extended Presidency wasn't grounded in the Constitution and couldn't itself adopt any decisions. Only one year after Tito's death, Yugoslav leaders had to face violent riots in Kosovo. On 2 April 1981 the Presidency under chairmanship of Cvijetin Mijatović declared a state of emergency in Priština and Kosovska Mitrovica, which lasted one week. The Presidency declared the state of emergency again, that time on the whole territory of Kosovo, on 27 February 1989 under chairmanship of Raif Dizdarević, when even more serious disorders in Kosovo broke out. For the third time in post-Tito Yugoslavia, the state of emergency in Kosovo was imposed by the Presidency in February 1990. Stipe Šuvar, Croat representative of strongly pro-Yugoslav opinions, was in October 1990 replaced by Stipe Mesić nominated by Croatian government. In summer 1991 Mesić and Drnovšek, regarding their republics independent, ceased to attend sessions of the Presidency. They were followed by Bogićević and Vasil Tupurkovski from Macedonia, so that the Presidency de facto ceased to exist, although the members from Serbia, her provinces (Kosovo and Vojvodina) and Montenegro continued to hold sessions until 1992.